Do you want to turn off your computer automatically at a specified time?Do you want the computer to launch your programs at a scheduled time?Do you want to listen the music while you are sleeping and shutdown computer after a while?Do you want the computer to remind you at a specified time?Do you want to lock the computer and display your favorite picture on the screen at a specified time after you leave? Now you can use Intelligent Shutdown to do all these jobs. 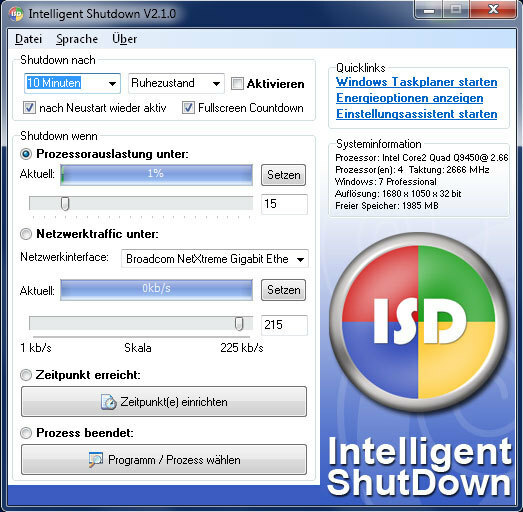 Intelligent Shutdown is smart, easy to use application that can automate a variety of tasks at a scheduled time. 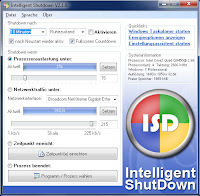 There is no need now to waste your time waiting for shutdown, restart or many more functions, with this intelligent tool you can almost schedule all your work like turn off, restart, launch a program, play music and shutdown automatically, add reminders or lock your PC and display your favorite picture. With its innovative, intelligent detection engine, WinMend System Doctor can effectively detect and fix security vulnerabilities in the system, fix software vulnerabilities in third-party applications, and prevent the running of malicious startup programs, Trojans, BHOs, processes and system services to significantly improve system security. It also provides an "Expert"-level system scan option that can scan potential security threats in the system and protect the system from the threats of spyware, adware, Trojans and viruses and eliminate security risks.